Branch connections can be made to existing pipelines in weld-hazardous areas by using PLIDCO® Hot Tapping+Saddles where surrounding conditions do not permit the immediate installation of a welded application. Utilizing the PLIDCO® Split+Sleeve design and construction, they are easily installed by simply tightening side bolts. The PLIDCO® Hot-Tapping+Saddle includes design criteria per code covering branch connections on pipelines. 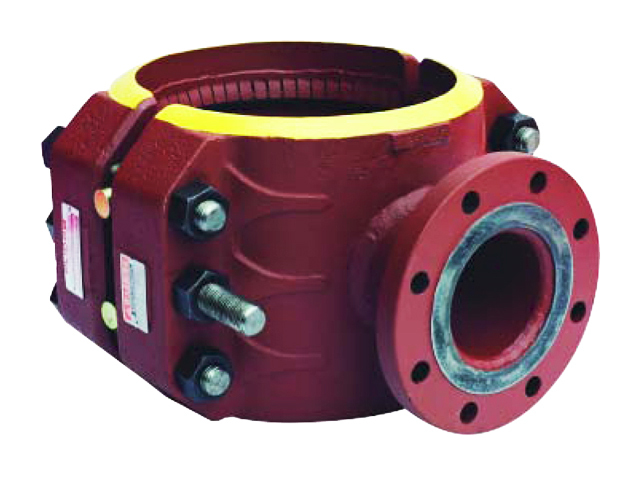 Available with full size branches and in any range of sizes and pressures, with threaded, welded or flanged outlets. Buna-n packing is standard, other packings available. PLIDCO® Hot Tapping+Saddles are used in weld hazardous areas and where company policy dictates that the hot tapping saddle be reclaimed, reconditioned and used again. Installation is faster since welding is eliminated. Just bolt on the PLIDCO® Hot Tapping+Saddles, assemble tapping equipment, perform a hydrotest and proceed with plugging operation. PLIDCO® Hot Tapping+Saddles, when used for plugging operations, are designed to include clamping area on each end to restrict any movement of the fitting because of possible forces induced when setting the plug. The plugging head, when set, will be within the PLIDCO® Hot Tapping+Saddle. When conditions are favorable, PLIDCO® Hot Tapping+Saddles may be permanently welded to pipeline.